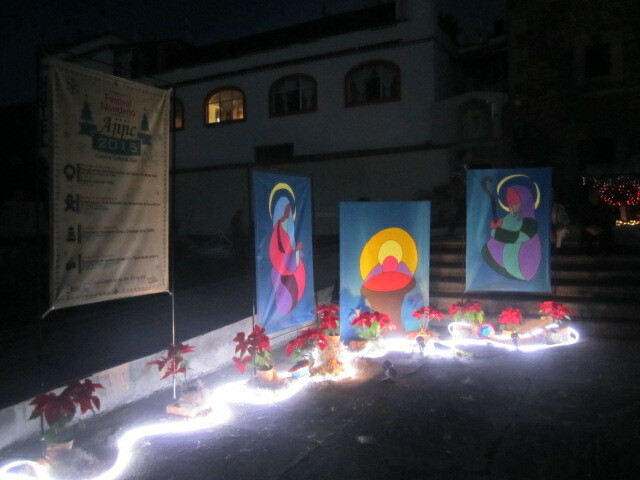 I walked into town in Christmas Eve to be part of all the activities and take photos of the Crèches at the church. Surprise, surprise. Very little action was taking place in the plaza this year and there were only four live crèches. 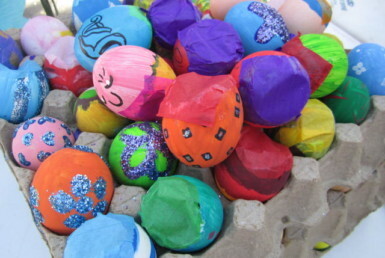 Last year the church yard was filled with crèches and the plaza was very busy. We have had weeks of excitement here, including parades and fireworks going off every evening. I have no explanation for the quiet Christmas Eve. I hope you enjoy what I managed to photograph. I apologize that my camera does not take good night photos. Decorations inside and outside of the church were lovely. Inside of the church there were bouquets of live flowers all along on the tables. 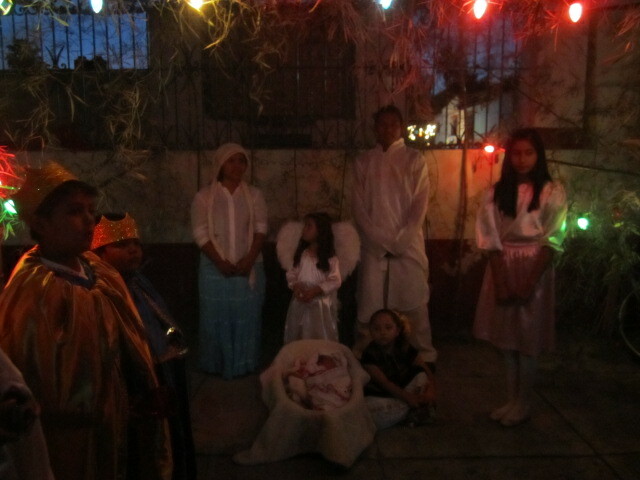 Outside were the crèches. Sawdust images on the ground, Christmas trees and many lights. It was very peaceful to walk around in the church yard. I liked the modern rendition of the crèche painted in the above photo. Simple yet elegant. 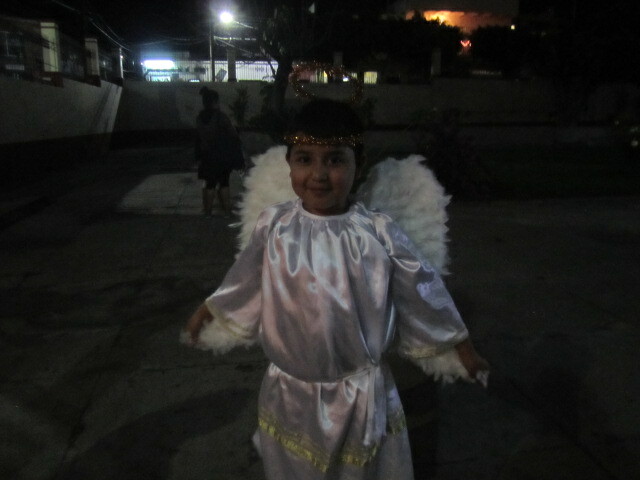 Check out the angel boy in the photo below. He was so proud of his costume. His mom was nearby to straighten his halo everytime it slid down his head. The crèche in the photo below just had children and a doll baby Jesus in it. 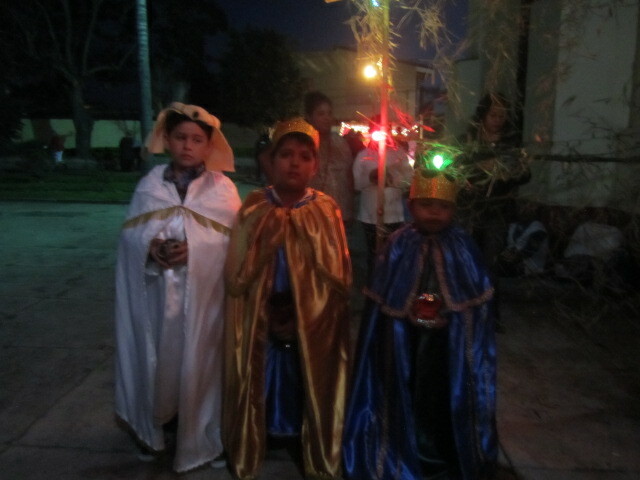 Two of the others had a live baby Jesus. But these children were having fun anyway, even with just a doll baby. 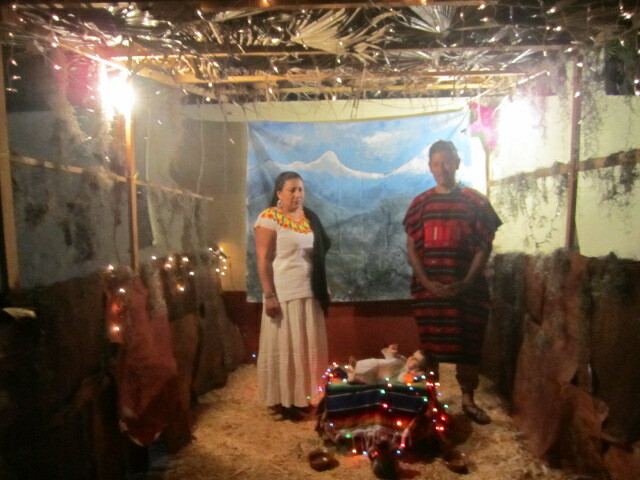 The young couple in the crèches in the photo below were using their own live baby for Jesus. What a treat for the family to be part of this celebration for their baby’s first Christmas. I hope their families got photos for future enjoyment. Another crèche below with a doll baby Jesus. Looks like they couldn’t talk any of their grown children into letting one of their babies play the part. I am guessing they have grown children. It is rare for a Mexican couple in that age group not to have a large extended family. 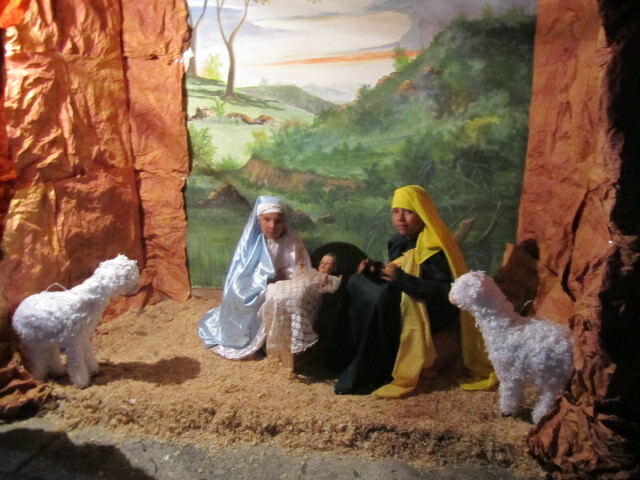 The crèche below has another live baby plus older boys who are playing the part of the three wise men. Below is a photo of the three wise men. They look bored already and the evening has just started. I took the photo below as I was leaving the church grounds. 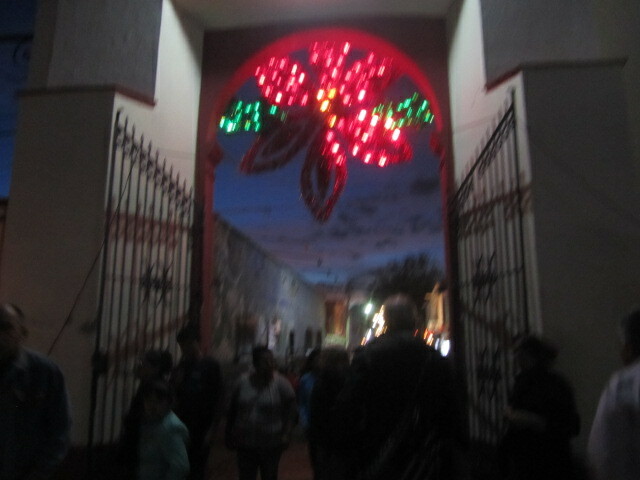 I liked the lights over the archway. Lots of people were coming in as I was leaving. 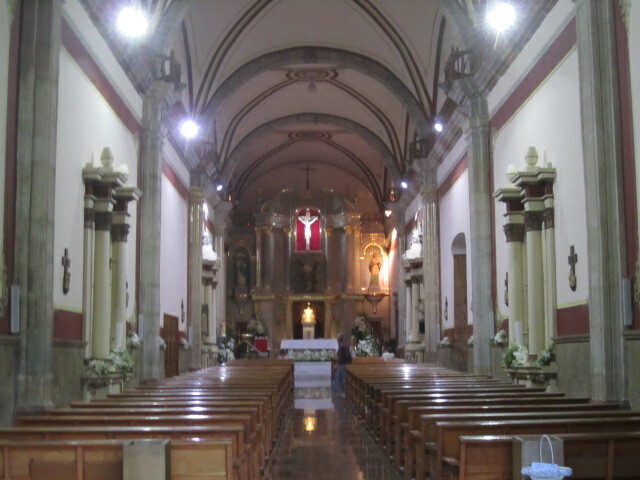 I walked down to the Ajijic plaza, just a block away from the church. Not many people were there. The restaurant and coffee shop were open. I sat at the coffee shop and bought hot chocolate and pumpkin pie and looked for photo ops. 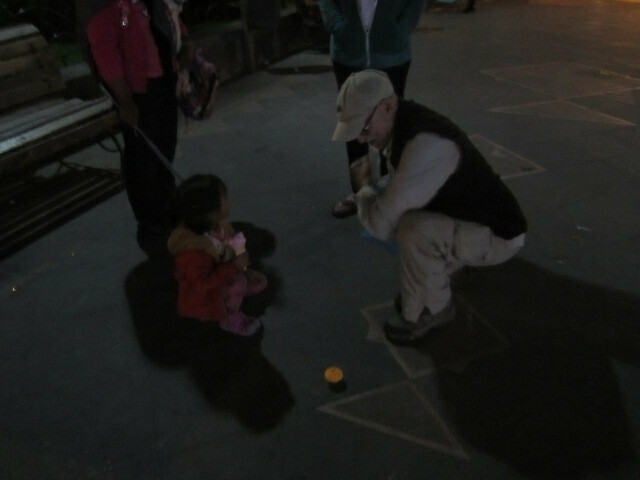 I watched an Expat man play with a top with a small Mexican girl. Maybe he has a grandchild in the States that he was missing. I liked the looks of the store below. 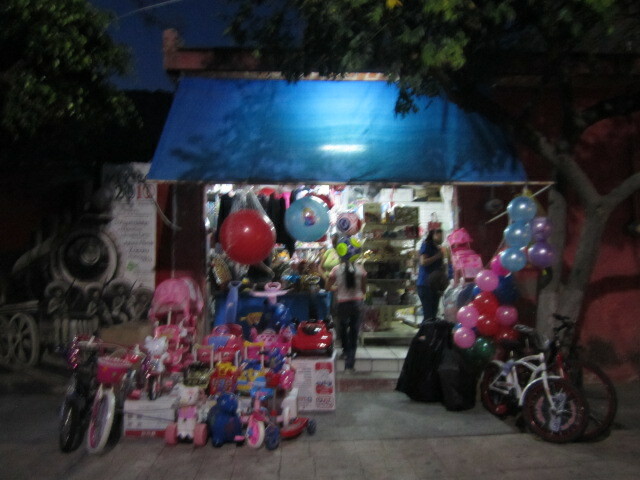 They had a wide variety of toys for the children. Some of the stores were open for last minute Christmas gift buying. 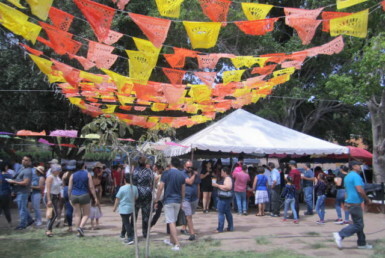 There were also stands set up in the plaza with handicraft items for sale. 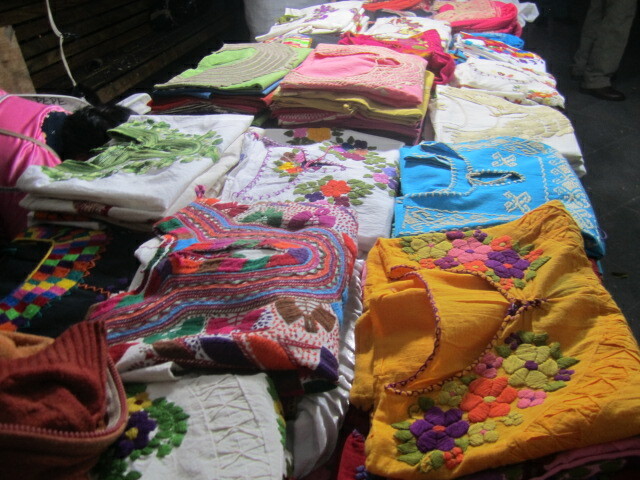 Some of the sellers were from as far south as Chiapas. The amber salesmen were from there. 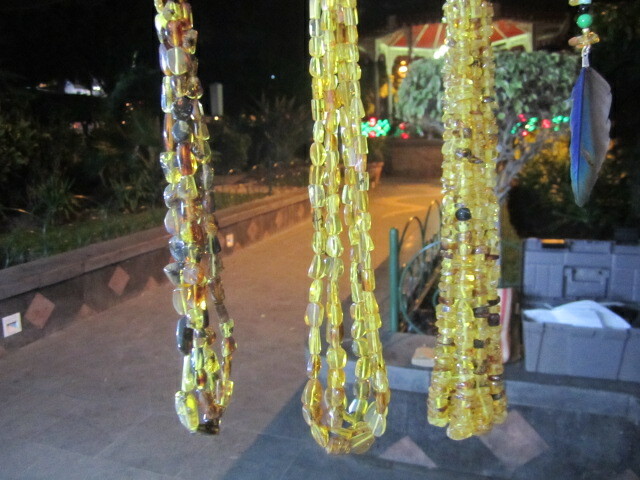 I regret not buying one of the beautiful necklaces made out of amber. 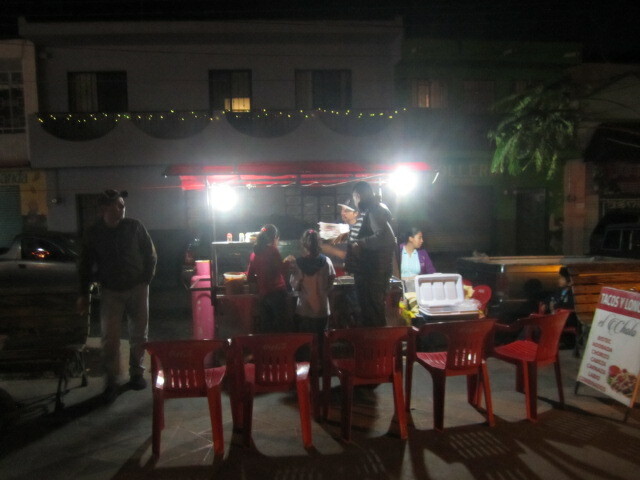 The taco stand had a steady flow of customers. It smelled delicious but I had already eaten. Check out the beautiful Amber necklaces and the embroidered blouses. 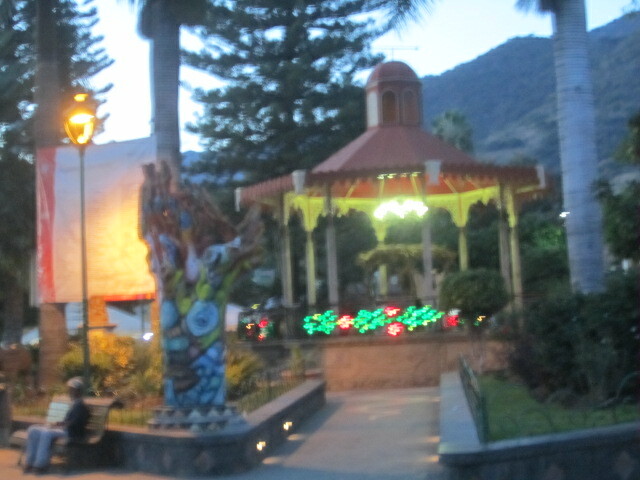 The photo below was of the bandstand in the center of the plaza. It was getting too dark for a clear photo. But inside of it is a crèche made with statues. The place for baby Jesus was still empty. They brought him in later. Below is the municipal building. 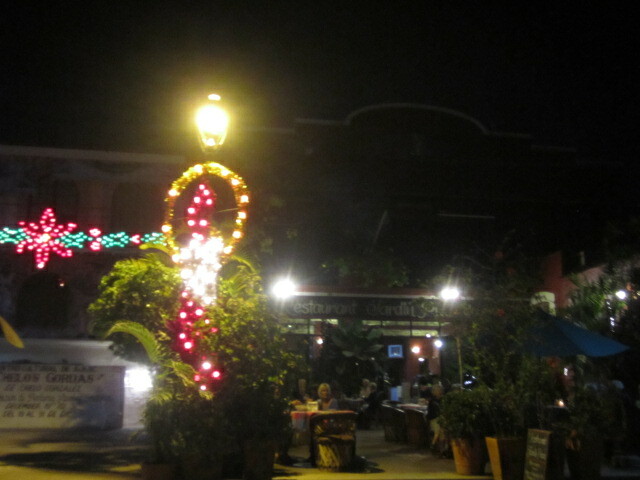 It is located on the corner near the plaza. 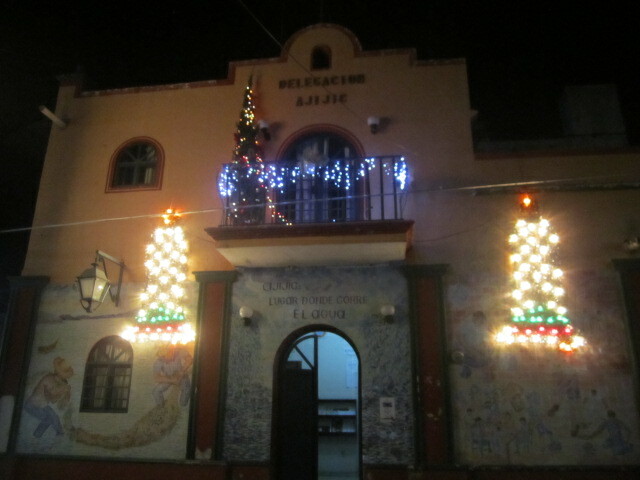 Every year it is decorated with many lights. 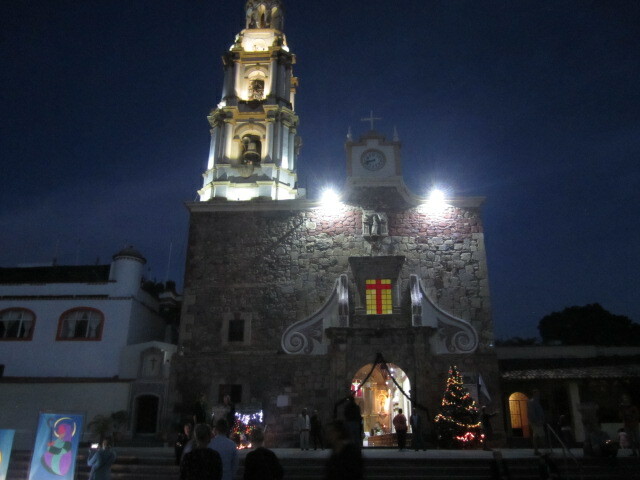 That was my Christmas Eve in Ajijic. Hope you will join me next year. It was a peaceful evening. I was glad for the respite from all the fireworks. But New Year’s Eve is just around the corner. It will be noisy. I am so thrilled to be coming to Ajijic in late March for several months…maybe more! I have been wanting to visit for ages and can’t wait to get involved in the LCS and other groups. Thanks for sharing your photos. We are just beginning to become familiar with the area since our last visit the week before the holiday. We just fell in love with the area, and are planning another visit either this spring or fall. 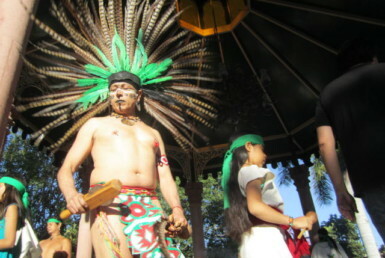 It is amazing how the Mexicans take part in their celebrations, very different than here in Canada. Mexico really appreciates the purpose of the event. Just beautiful pictures, I love the bright colors of everything, majestic! See you hopefully when you get back.